Belgium residents can play at most of the live casinos offered to players in Europe and the United Kingdom. Belgium has eight casinos, with four on the coast in and around Oostende and the remaining four scattered around the southeastern part of the country. The biggest casino in Belgium is the Casino Kursaal Oostende, which originally opened in 1857 but was later destroyed during World War II, which led to it being rebuilt. 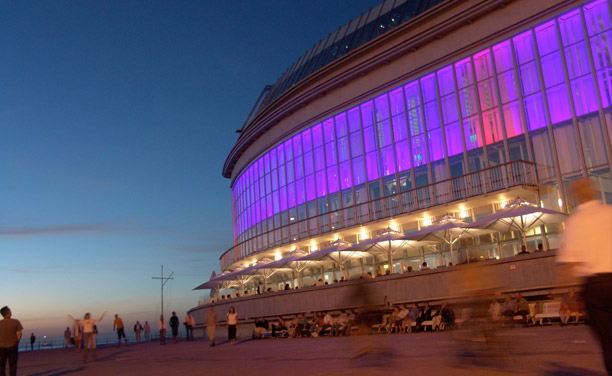 Open daily from 9 a.m. to 7 a.m. for slot machines and from 3 p.m. to 5 a.m. for table games, Casino Kursaal Oostende has more than 26,000 square feet (2,646 sq. m.) of gaming space. The casino contains 150 gaming machines and offers several table and poker games, with 10 American Roulette tables, six Blackjack tables, one Casino Stud Poker table, Electronic Roulette, 13 Poker tables, one Sic Bo table and one Stud Poker table. The casino also has a restaurant. Belgium, a founding member of the European Union and the home of the EU's headquarters, has borders with four other European countries: France, Germany, Netherland and Luxembourg. A densely populated country, it covers an area of almost 12,000 square miles (almost 30,528 sq. km) and has a population of approximately 11 million people. Belgium has three official languages, Dutch (the native language of 59% of its population), French (40%) and German. The geography of Belgium combines sand dunes toward the coast, as well as waterways and valleys farther inland, forests, gorges and caves, and also offers picturesque towns, castles and chateaux, and cities of culture. Lying at the heart of a considerably industrialized region, Belgium is the world's 17th richest economy by GDP. Foreign trade is of great importance to the country. Its main exports are iron and steel, machinery and equipment, chemicals, textiles, finished diamonds, metals and metal products, and foodstuffs. Culturally, Belgium has been at the heart of many art movements of great influence across Europe, particularly during the Renaissance and Baroque periods, with prolific painters including Jan van Eyck (renowned for his religious paintings in the 15th century), Peter Brueghel and this landscape paintings in the 16th centrury, and Anthony van Dyck and Peter Paul Rubens during the 17th century. Nearer to the present day, distinguished artist such as René Magritte and Paul Delvaux emerged as leading innovators. Within the world of architecture, the Art Nouveau structures of Brussels hold "World Heritage" status from UNESCO. Several writers have emerged from Belgium, including the poet Paul Verlaine, novelist Georges Simenon and Hergé, creator of the "Adventures of Tintin" comics. In fact, a new museum dedicated to Hergé was opened in 2009 in Louvain-la-Neuve, a new town outside of Brussels. It contains not only his Tintin creation, but also other characters he created, as well as magazines, advertising and film posters. Belgium has a rich folkloric heritage and even today, Belgium holds several festivals and carnivals through the year that are steeped in religious or mythological legend. Sports have been at the forefront of Belgian entertainment and leisure for several years, with famous Belgians today including the cyclist Eddy Merckx and tennis champions Kim Clijsters and Justine Henin.